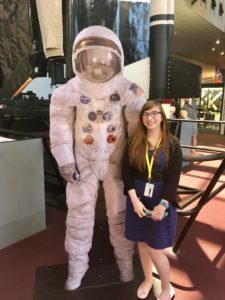 While pursuing her PhD in Public History at George Mason University, Anne Ladyem McDivitt is interning this summer at the Smithsonian National Air and Space Museum in Washington, DC. She is working on curatorial projects in the Space History department. According to a recent article published in the Dyersburg State Gazette, a portion of Anne’s tasks while interning at the institution will be to conserve and display Neil Armstrong’s spacesuit from Apollo 11 in time for the 50th anniversary of the mission in 2019. Click to read more about Anne’s internship, interest in history and experiences studying Public History at UCF in the article featured in her hometown newspaper, the Dyersburg State Gazette.